Today I lost my best friend, the World has lost the best guy and bass player to ever live. Duck Dunn died in his sleep Sunday morning May 13 in Tokyo Japan after finishing 2 shows at the Blue Note Night Club. A page has already been put up on Facebook saluting Dunn, "A place for fans, friends, and others to share their messages of support or respect for those who cared for such an incredible person..."
Dunn grew up in Memphis, a close friend in childhood with Cropper. In their teens, Dunn and Cropper formed the group the Royal Spades with Dunn on guitar, Cropper on bass, future Memphis Horns player Wayne Jackson on trumpet, Charlie Freeman on guitar, Terry Johnson on drums, Don Nix on baritone saxophone, Charles "Packy" Axton on saxophone, John "Smoochy" Smith on keyboards and Ronnie Angel on vocals. At the urging of Axton's mother, who owned Satellite Records, they changed their name to the Mar-Keys and, in 1961, went to number 2 on the R&B and 3 on the pop charts with Last Night. Dunn left soon after to play with Ben Branch's Big Band but would return to the rock charts in 1964 when he replaced original bassist Lewie Steinberg in Booker T. & the M.G.'s. Dunn, along with the Memphis Horns and drummer Al Jackson, Jr., also became the house band for Stax Records, playing on such big hits as Respect and I Can't Turn You Loose by Otis Redding, In the Midnight Hour by Wilson Pickett and Hold On, I'm Coming by Sam & Dave. Booker T. & the M.G. 's also continued to branch out from their original Memphis sounds on albums throughout the 60's and 70's. 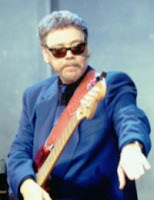 Dunn also became a major session player on his own for everyone from Eric Clapton to Bob Dylan to Stevie Nicks and was a regular member of the Blues Brothers Band and appeared as himself in both Blues Brothers movies. Dunn went into a semi-retirement in the middle of the last decade but continued to play occasional M.G. 's shows along with special shows. Our deepest condolences go out to the Dunn family and the friends of Donald who were on tour with him in Tokyo. He will be missed. Here's our last photo with him from last year's Sarasota Blues and Music Fest with featured performer, Shaun Murphy.